IETF KEYPROV Working Group: Why? • Starting point for KEYPROV working group formation early 2007: – Vendor-specific solutions for provisioning one-time passwords (and meta -data) but no standardized solution available. • Provisioning scenarios included – over the wire – over the air – or offline (bulk) • No standardized container for keys and meta-data available either. 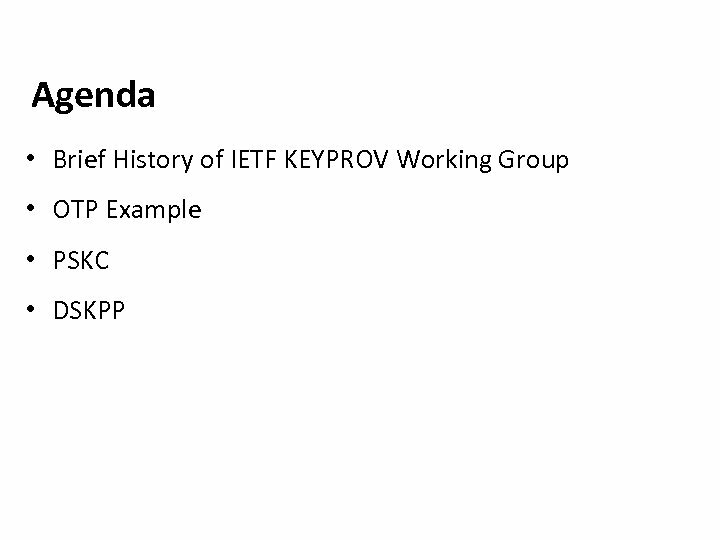 IETF KEYPROV Working Group: Why? (Cont. ) • No interoperability – between client and servers for provisioning symmetric keys. – between servers from different vendors. 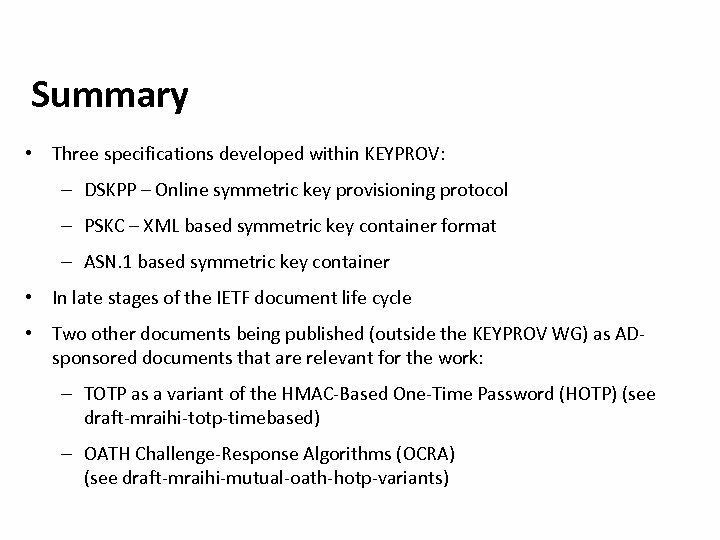 IETF KEYPROV Working Group • Description Current developments in deployment of Shared Symmetric Key (SSK) tokens have highlighted the need for a standard protocol for provisioning symmetric keys. The need for provisioning protocols in PKI architectures has been recognized for some time. Although the existence and architecture of these protocols provides a feasibility proof for the KEYPROV work assumptions built into these protocols mean that it is not possible to apply them to symmetric key architectures without substantial modification. 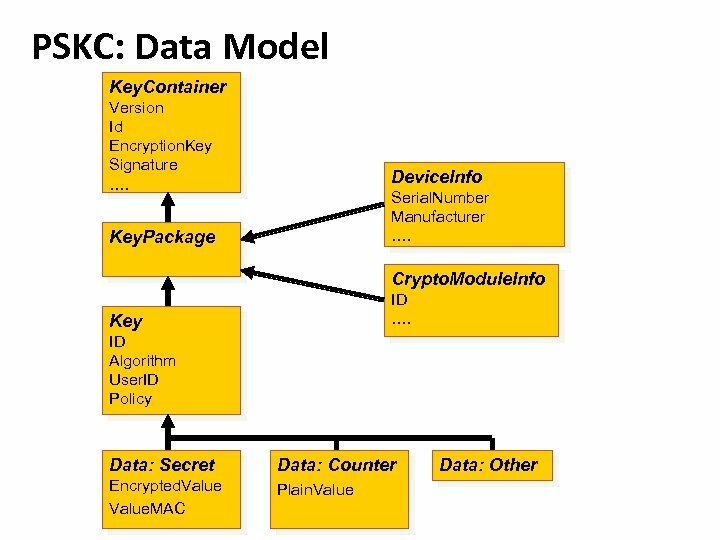 In particular the ability to provision symmetric keys and associated attributes dynamically to already issued devices such as cell phones and USB drives is highly desirable. 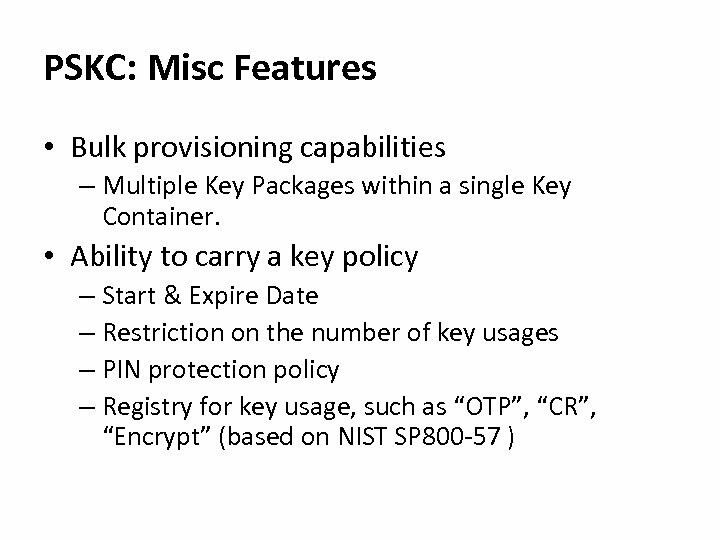 PSKC: Overview • Portable Symmetric Key Container (PSKC) is a standardized XML-based document for transporting symmetric keys and key related meta data. • Specifies the information elements that may be required when the symmetric key is utilized for specific purposes, such as the initial counter in the HOTP algorithm. 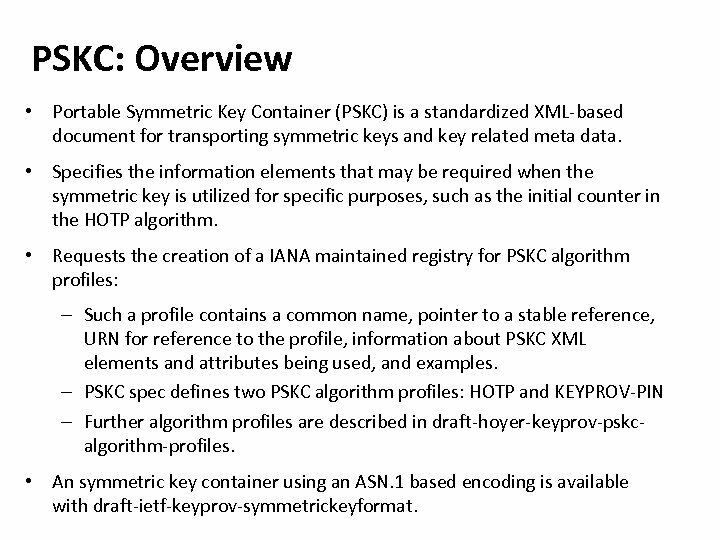 • Requests the creation of a IANA maintained registry for PSKC algorithm profiles: – Such a profile contains a common name, pointer to a stable reference, URN for reference to the profile, information about PSKC XML elements and attributes being used, and examples. – PSKC spec defines two PSKC algorithm profiles: HOTP and KEYPROV-PIN – Further algorithm profiles are described in draft-hoyer-keyprov-pskcalgorithm-profiles. • An symmetric key container using an ASN. 1 based encoding is available with draft-ietf-keyprov-symmetrickeyformat. 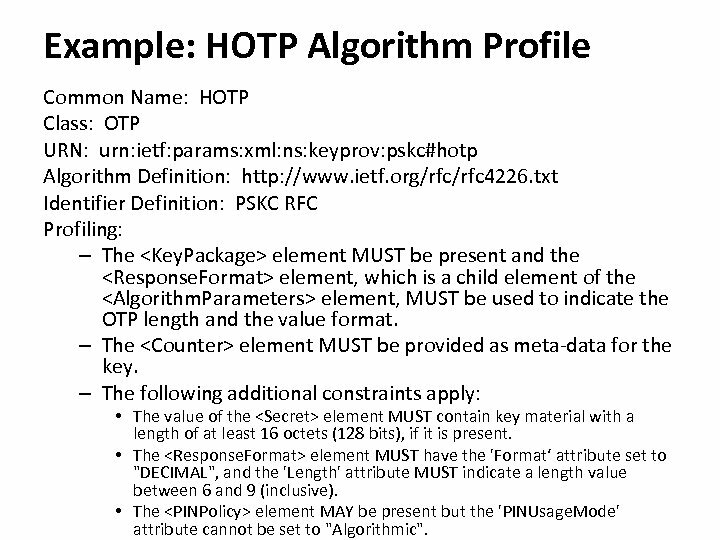 Example: HOTP Algorithm Profile Common Name: HOTP Class: OTP URN: urn: ietf: params: xml: ns: keyprov: pskc#hotp Algorithm Definition: http: //www. 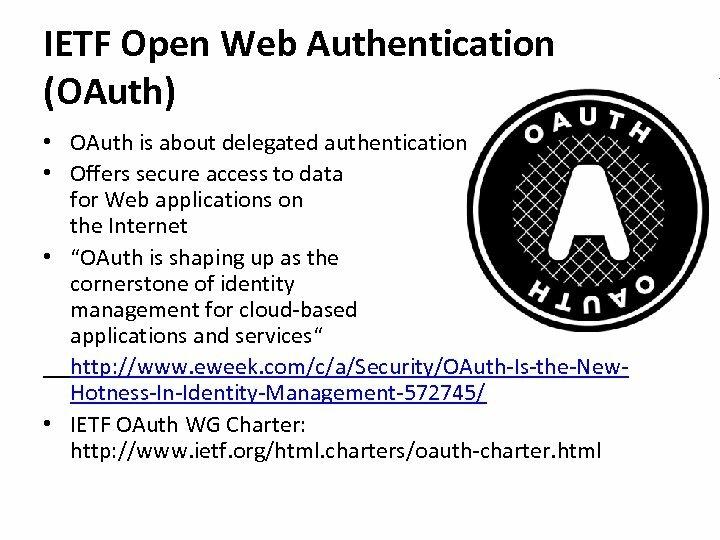 ietf. org/rfc 4226. txt Identifier Definition: PSKC RFC Profiling: – The element MUST be present and the element, which is a child element of the element, MUST be used to indicate the OTP length and the value format. – The element MUST be provided as meta-data for the key. – The following additional constraints apply: • The value of the element MUST contain key material with a length of at least 16 octets (128 bits), if it is present. • The element MUST have the 'Format‘ attribute set to "DECIMAL", and the 'Length' attribute MUST indicate a length value between 6 and 9 (inclusive). • The element MAY be present but the 'PINUsage. Mode' attribute cannot be set to "Algorithmic". 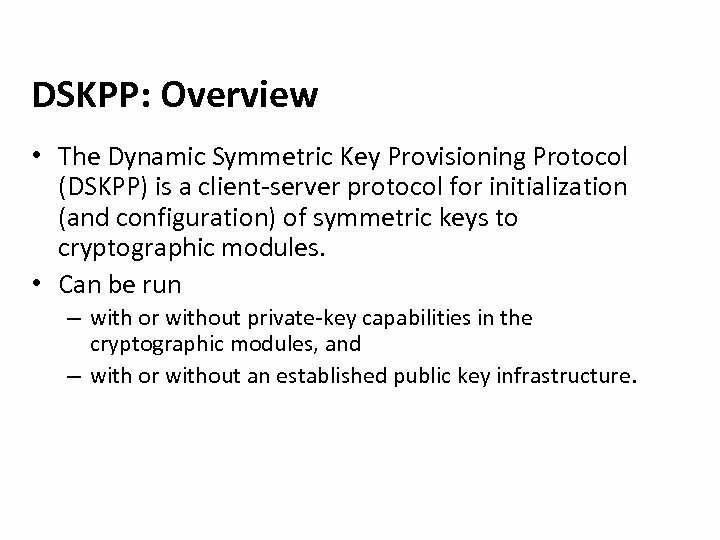 DSKPP: Overview • The Dynamic Symmetric Key Provisioning Protocol (DSKPP) is a client-server protocol for initialization (and configuration) of symmetric keys to cryptographic modules. • Can be run – with or without private-key capabilities in the cryptographic modules, and – with or without an established public key infrastructure. 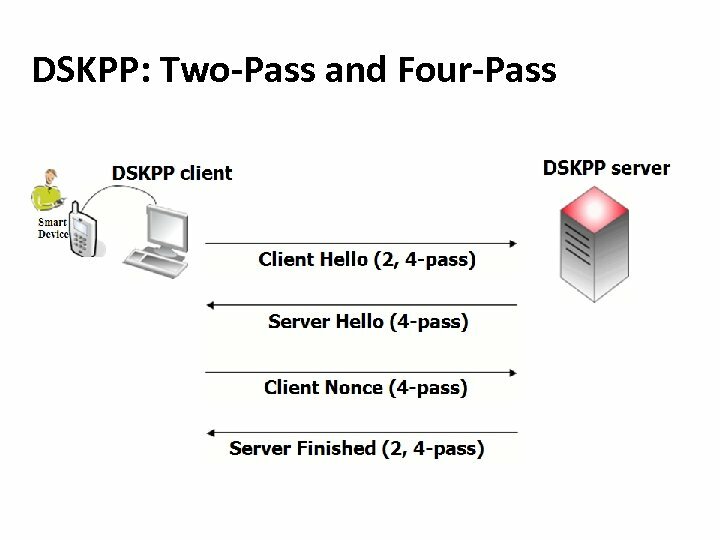 DSKPP: Protocol Variants • DSKPP variants support multiple usage scenarios: – Four-pass variant enables joint key generation by the provisioning server and cryptographic module; provisioned keys are not transferred over-the-wire or over-the-air. 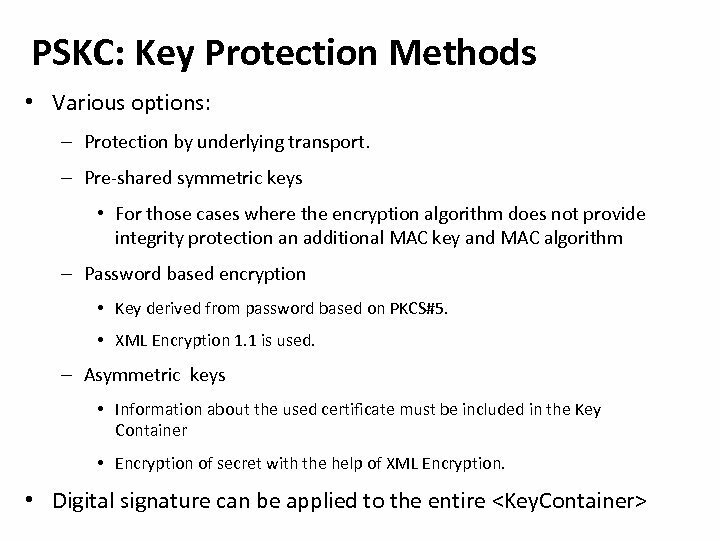 – Two-pass variant enables generation and transport of symmetric keys to a cryptographic module. – Two-pass variant also enables transport of pregenerated (e. g. , legacy) keys to a cryptographic module. 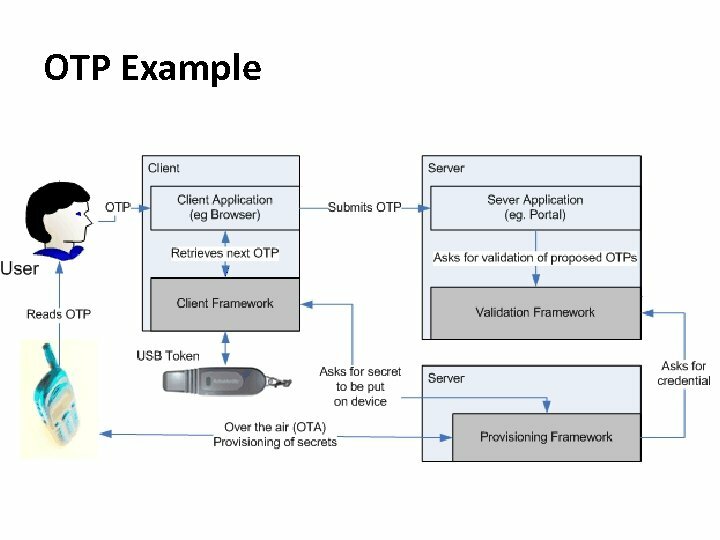 DSKPP: Transport • • Security Binding – Transport Layer Security is not required for key transport – TLS useful for confidentiality protection of the exchanged parameters. Defined HTTP transport binding – New MIME-type registered. – No SOAP binding standardized because not useful.